According to the makers of Conan The Barbarian - Barbarism equals to screaming, mindless splatter of blood and gore (Dexter stay away, not worth your time) and no sense of story or characters. To top it all, the film is in 3D. If you still want to endure the torture of this mindless war film, please find a 2D version. Better more, rent the Arnold Schwarzenegger’s 1982 version of the film. Please. I can tell you who will love Conan The Barbarian - Bulky, gym-going, Hayabusa driving, testosterone sweating, alpha males whose worst fear is being called Gay. They’re afraid to cry, or wear pink, but anything that spells b-l-o-o-d and involves manly barking, is FUN! 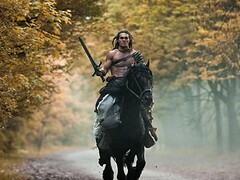 And keeping with the cliché, Conan The Barbarian is all blood, sweat and low-baritone action. Not to mention, mindless, plotless and painful. Michael Nispel’s Conan the Barbarian, which was brought to attention by Arnold Schwarzenegger in the 1982 version of the film, follows pretty much the same plot (?). Conan (Jason Momoa) is born amidst war, and grows to be a brutal, fearsome warrior. He stands out among his peers because of his mastery with swords. When he returns to his village, he finds it under the hostage of the powerful warlord Khalar Zym (Stephen Lang). The film tracks Conan as he fights for the dignity of his village – rather barbarically. When the film opens with a gruesome scene, at that moment you think it could be a thrilling film – coupled with a story and a reason for us to take a journey through all the fights, blood and tears. However, our dear friend Conan here seems to jump from one fight to another without joining any dots. The entire “story” is told to us in a hurried first 10 mins, following which it’s “Dishum!” – 20 dead, a dance of swords and rivers of blood. Sadly, there’s nothing epic or legendary about it. I have friends who have read the Marvel comics of Conan the Barbarian who tell me that the comics are much more detailed, enchanting and grand. They give you a sense of journey, of a real fight. Schwarzenegger’s version of the film made him an international star, because the 1982 film had convincing screen savagery, and set a benchmark for raw, rugged action. Conan The Barbarian in 3D however, is repetitive and just boring. It’s the same sequences being rotated in this washing machine of a film. A set of bloody, gory war scenes and sinister, half-smirking villains who love evilness just makes for a very frustrating 2 hours. It seems like the makers learnt nothing from their predecessors. The 1982 version has a grand background score, earning immense popularity, given by Basil Poledouris. This Conan The Barbarian – has screams. Please save yourself from the film. And from this wallet-tearing trend of 3D that is basically another head-ache inducing mechanism. You’d be much better off watching some soap-opera re-run on TV. I admit I was intrigued by the movie because the 1982 Arnold Schwarzenegger’s version was quite great but since your review clearly tells me that it was a rather unworthy film I will not watch it anymore. I hate sitting for more than a hour watching a movie that’s not worth my time. Thanks for the tip. CARiD has posted 1 comments and has rated 0 movies. See CARiD's page for more details.